I know it's a total and complete cliche, Turkey Pot Pie to use up some of the leftovers from Thanksgiving. But I'm of the firm conviction that the old tried and true is good. Nothing fancy here, just plain old goodness. I do use Puff Pastry instead of pie dough, mainly because you can make it look spectacular and it tastes good. Which actually is the point, that it taste good. The filling, ready to be topped. Puff Pastry rolled out a little with leaf shapes cut into it along with the scoring. Scoring the Puff Pastry in squares, makes it a little easier to serve out. 1 2/3 sheets of puff pastry, rolled out a little. Drain the carrots and celery and set aside, reserving the turkey stock for the gravy. Chop up the turkey into bite size pieces and set aside. 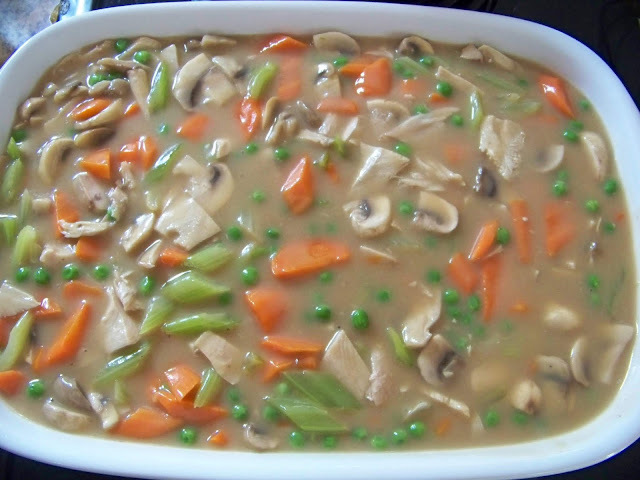 Make the gravy with the reserved turkey stock, then place the veggies, peas, mushrooms and turkey into the gravy, check for seasoning, adding salt and pepper if you like. Let it cool before completing the next step, if you can. Pour into a large casserole dish, 9x13 and top with the rolled out puff pastry. You can cut shapes out of the pastry at this point, before placing it on the pie filling. 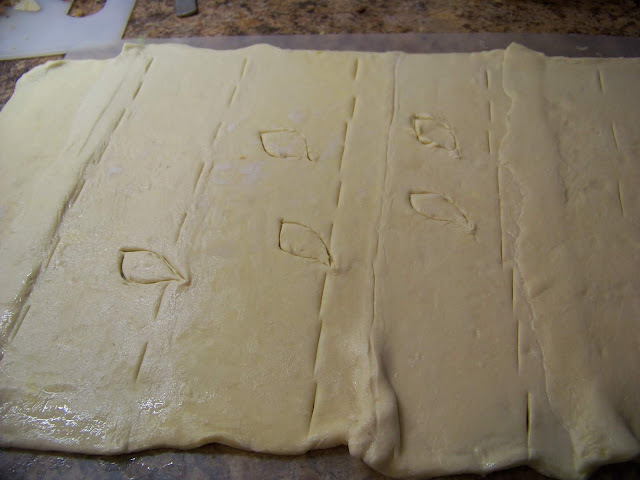 (I will cut a strip off of one side of the Puff Pastry sheet and then make leaf shapes or other shapes, and place them on top) Puff Pastry does shrink up, so you want to drape the pastry over the sides of the casserole dish. If one sheet won't cover it, then use part of another sheet. 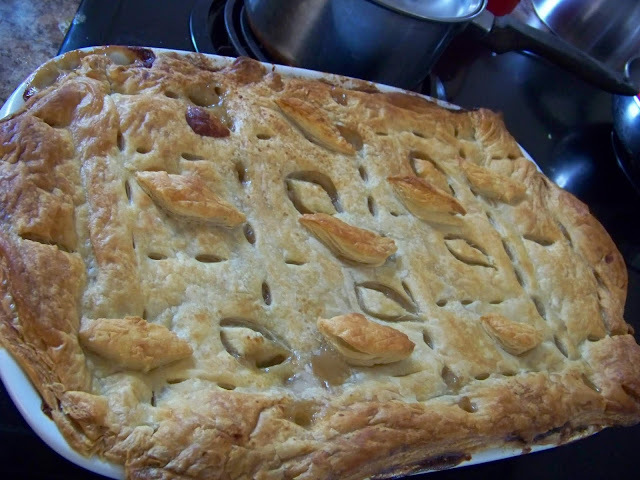 I also scored the pastry sheet to make it easier to scoop out servings, and it made it look kind of pretty as well. Bake for 30-40 minutes at 375 deg. or until the puff pastry is golden and puffed up. What a beautiful crust for your delicious Turkey Pot Pie! Hope you are having a good week and thanks so much for sharing with us at Full Plate Thursday! 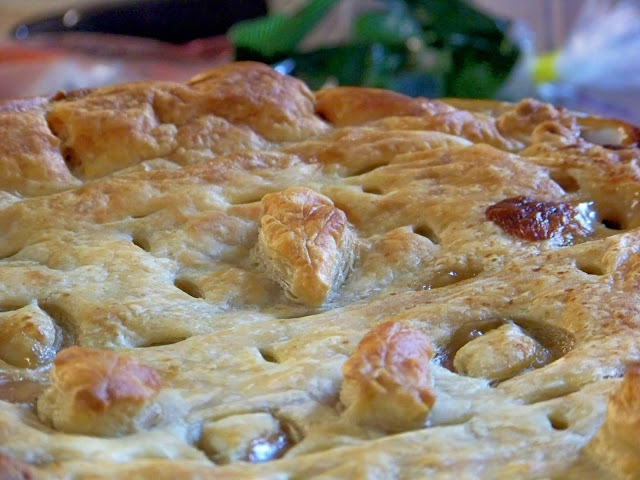 A puff pastry crust is perfect for a pot pie. I do it often, and in fact, have been known to cook a turkey breast just so I can make this pie. Thanks for hosting Full Plate Thursday as well.